You can manage and control simultaneous user sessions on your WordPress site with the Users Sessions Management for WordPress feature. With this feature you can control for example how many simultaneous logged in sessions the same WordPress user is allowed, or block them. Why should you manage multiple same users sessions? Why should you manage multiple same user sessions? By default WordPress allows the same user to have multiple simultaneous sessions. So if someone from the US office logs in to WordPress with the username Robert, someone else can use the same user Robert to login from the European office. As a security best practices usernames should not be shared otherwise you won’t be able to use the WordPress activity log to track down who did what. Also, if you have a user subscription business, by default you cannot control who logs in, so a paying customer can share the credentials with others to access the paid content for free. Blocking multiple same user sessions can also work as a security feature – in case a hacker guesses the password of another user, he cannot login while the other user is logged in, thus keeping the hacker out. And when the malicious attacker tries to login and his session is blocked, the administrator receives an email alert about the suspicious activity, allowing them to take the necessary evasive actions. Set the setting Multiple Sessions to Allow up to and specify the number of simultaneous sessions you would like to allow per user. When you configure the plugin to allow up to three sessions, the fourth individual who tries to login with the same username will be blocked. Set the setting Multiple Sessions to Block. Set the setting Allow blocked sessions to override existing sessions to No, do not allow override. When a user’s session is blocked, the user will be shown the following notification when trying to login. You can change the notification text from the Blocked Session Error in the same settings page. If you select this option, once someone tries to login with the user robert, the logged in session with the user robert will be terminated without warning. This might result in unsaved work. If you select this option you have to specify the override password in the plugin’s settings. 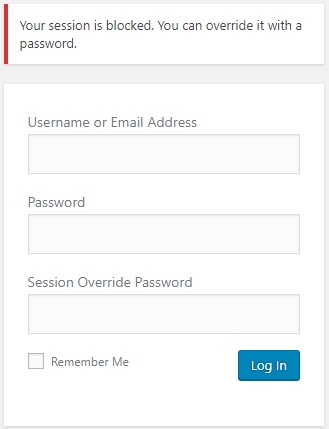 When this option is enabled, the user attempting to login to WordPress have to specify an override password if an existing logged in session exists for the same username. 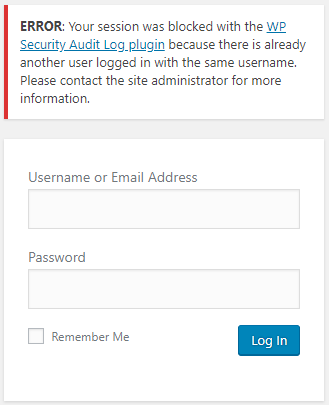 If the correct credentials and override password are provided, the existing logged in WordPress user session with the same username is terminated without warnings and the new user session is allowed to login. You can configure notifications in the plugin so you are alerted via email when a WordPress users session is blocked or there are simultaneous same user sessions, as explained in the post How to Limit & Manage Users Sessions in WordPress Sites & Multisite Networks.